Is Jeremy Corbyn the only answer to Trumpism? Donald Trump’s election changes everything. That’s a banality that does no justice to quite what a shift in global politics we are about to see. This could herald the end of ‘The West’ as we understand it. How much of it will be rolled back is difficult to know; those centuries old connections that became the alliances of the world wars, were strategically strengthened during the Cold War period, and then formalised into the political and economic structures that essentially run our world now – what will be left? Trump, at best, appears ambivalent about many of America’s closest relationships. His isolationism, coupled with international anti-establishment pressures (see also: Brexit) will create a vacuum and the certainties of order will no longer. The new leader of the Free World apparently has very little interest in that aspect of the job. On the face of it, there should be a huge chance for Jeremy Corbyn to play a part in reshaping what comes next. Many of the institutions that Trump is hostile to – NATO, the EU, WTO and IMF – are ones that Corbyn has a had long-standing scepticism of. In many ways, this is what Corbyn has been waiting for for decades. This can be seen as a railing against the elites from those who have felt left behind and forgotten by a system that did not work for them and a political class that didn’t care. The Labour leader recognises this. He said so himself this morning: “Trump’s election is an unmistakable rejection of a political establishment and an economic system that simply isn’t working for most people. It is one that has delivered escalating inequality and stagnating or falling living standards for the majority, both in the US and Britain. This situation, this tumult, is surely the greatest opportunity for Corbynite politics in generations. His broadest analysis of where the world has been going wrong – the neoliberal consensus of the last 30-odd years – has now arguably been vindicated as electorally convincing several times over. No one is claiming that the two are similar, policy-wise. There is no comparison to be made between the openly racist and misogynistic billionaire from New York and the vegetarian, allotment-tending cyclist in Islington there. But the context of this result does leave me wondering: if this isn’t Jeremy Corbyn’s moment, then what is? If his politics can’t deliver victory in this situation, then when can it? 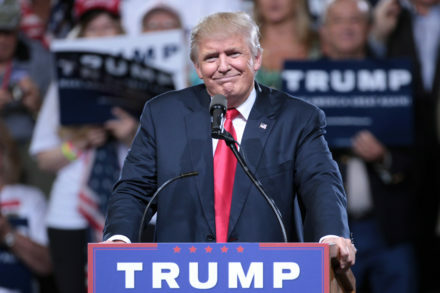 Trump won despite a brash antipathy towards the media, despite vast public opposition within his own party and he won on the back of an appeal directly to those who have felt excluded from the political process. Why did the Democrats not beat him? For many on the British left this morning, the answer is clear: they needed a candidate who was less establishment and more left wing. I did not wake up hopeful this morning. I do not think that progressive forces, in Britain or America, will recover from our recent defeats anytime soon. I do not look at Labour and see a party heading for power, I see one moving further from it. I am despondent. But it is in times of crisis that true political leaders create opportunity. Last night compounded a growing feeling: Jeremy Corbyn’s time is either now, or he does not have one.